SMV Fundraising Dinner — MVCoC Foundation, Inc. 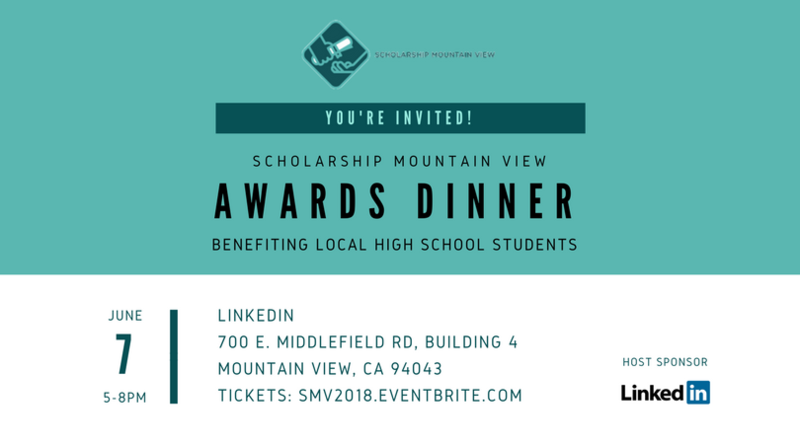 Please join us on Thursday, June 7, 2018, at our inaugural Scholarship Mountain View Awards Dinner to award the student recipients their scholarships. This event will be held annually to acknowledge the students and help us raise money for next year's scholarship fund. The event is hosted by LinkedIn Corporation and will be held at their offices at 700 E. Middlefield Road, Building 4, in Mountain View. The Reception starts at 5:00 P.M, with Dinner to begin at 6:00 P.M. If you are unable to attend the dinner, you can also participate by donating HERE. Scholarship Mountain View is a program of the Mountain View Chamber of Commerce Education Foundation, a 501c3 non-profit. All donations fully tax deductible, and these funds go directly towards the student scholarship.